Autism is a condition that knows no gender, social strata, religion or race. The condition is present in many countries outside the Philippines -- each having its unique approach to intervention, government support and advocacy focus. 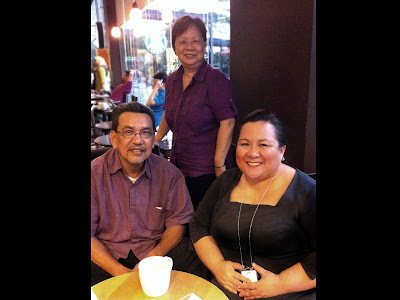 I recently travelled to Malaysia for work and had the opportunity to meet, after hours, with the leadership of the National Autistic Society of Malaysia (NASOM) -- Mr. Bistaman Siru Abdul Rahman, Chairman and Ms. Chai Liaw Kee, General Manager -- to learn about the unique experiences of the disability community in Malaysia. The National Autistic Society of Malaysia was established 25 years ago by concerned parents of children with autism. There was little information and practically no teachers and therapists back then, so the organization had to drive the changes they wanted to see. NASOM built and operated schools for children with developmental disabilities and even subsidized the education for their students, offering a better option to special education in public schools. Since their humble beginnings, the society grew to the community pillar they are today -- operating therapy centers, schools, group homes, vocational centers, among other services. The support from the Malaysian Prime Minister's wife, Datin Seri Pduka Rosman Mansor, was a welcome addition to NASOM's basket of blessings. The patronage of such a strong political and public figure paved the way for heightened public awareness on autism and the ready participation of corporate sponsors in their many initiatives. Very recently, they opened the NASOM Creative Arts Center, through the efforts of consultants from the UK and New Zealand and the Sime Darby Foundation. Television stations have also, on their own, began information campaigns to support NASOM's mandate. The meeting would not have been complete without sharing the many initiatives ASP has taken to further our goal of advocating for individuals with autism. I spoke to my new friends of the 1Pangako Campaign and managed to get Mr. Bistaman and Ms. Chai on film with their simple pledge. A simple afternoon of sharing our hopes and dreams between friends is an important part of our growth as societies. International linkages allow us to look at how we can improve our organization. Best practices of our ASEAN neighbors, when shared, inform -- and best of all, inspire.